You’re ready to get your glow on, but the weather outside is frightful! Or maybe your schedule doesn’t permit a lot of time in the sun, but you love how you look and feel with a tan. You’re in luck because our experts researched and reviewed the best tanning bed lotions to help you shop for the right product to suit your tanning needs. If you’re ready for a little fun in the fake sun, then read on to find out which lotion will work wonders with your skin. Before you start shopping, though, take a look at some specifications to keep in mind. They’ll help you make the right choice. Bronzer: If you want a tan, and you want it now, then you’ll need a lotion with bronzer. It will provide instant color, so you’ll be darker when you walk out of the salon after just one session! Moisturizing: UV rays can be harsh. Beat dryness and skin irritation with a hydrating lotion that leaves you feeling silky soft and smooth. Check this spec for the details on each lotion. Color Intensity: Different strokes for different folks. Some like getting and staying as dark as possible, while others go after a minimal glow. Check this spec to find out how strong each lotion is. Paraben Free: If you’re an ingredient-conscious shopper, check this spec to determine if each tanning lotion on the list contains parabens or not. Aloe: Stay comfortable when your lotion of choice contains aloe, a skin-soothing ingredient that counteracts the pain of burning and irritation. Weight: Check this spec for the details on how much lotion comes in each bottle for a rough idea of how many uses you’ll get with each choice. Now that you have a good idea of what to look for while shopping, you’re ready to check out our tanning bed lotion buying guide. We combed through countless tanning bed lotion reviews to bring you a top ten list of some of the most effective, versatile lotions on the market. Every product on the list boasts rave reviews, so shop around freely and find the one that suits your needs. If you’re in a hurry, check out our top and budget picks first. Let’s get shopping! Landing the list as our favorite pick for the best tanning bed lotion is Ed Hardy’s Coconut Kisses. A unique and powerful blend of ingredients, this premium lotion works to leave you with bronzed, smooth, and younger-looking skin! 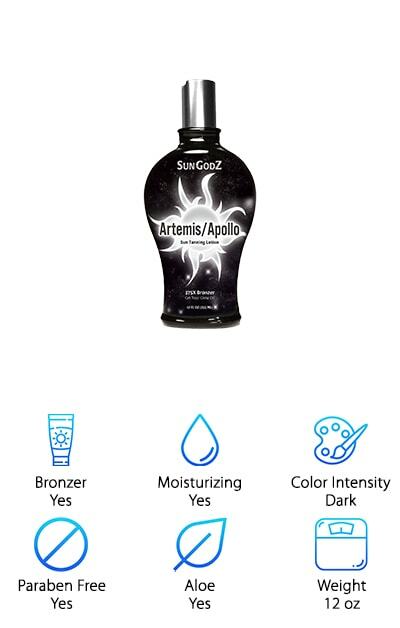 And the 13.5-ounce bottle will keep you tanning for multiple visits. 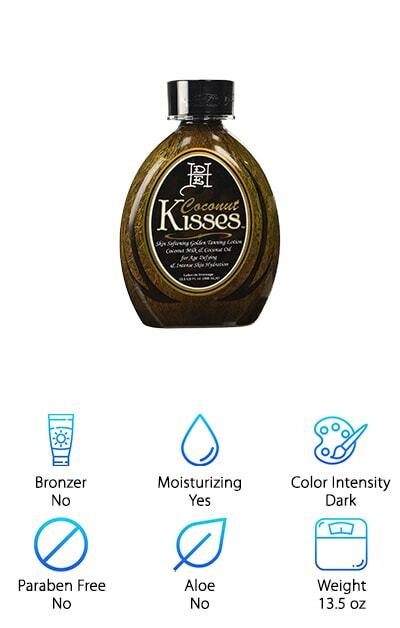 Formulated with a quad Tyrosine and MelanoBronze blend, Coconut Kisses stimulates and increases melanin formation, effectively accelerating the tanning process. Melactiva, a melanin synthesizer, takes over to generate darker, longer-lasting results. You might be wondering how this luxury lotion delivers anti-aging properties to your skin. It’s created with a specific BodyFit formula that reduces the appearance of cellulite and promotes skin firmness. You’ll look and feel better all around, after tanning with Coconut Kisses! Featuring a tropical coconut smell, you’ll love closing your eyes and getting lost in the feeling of being on a relaxing vacation. Make Coconut Kisses your companion to your next round of “me time,” and feel refreshed, renewed, and uplifted! Are you looking for the best cheap tanning bed lotion to help you get a glow, without hitting your wallet too hard? Well, look no further, because Millenium products deliver powerful bronze to your skin for a budget price. 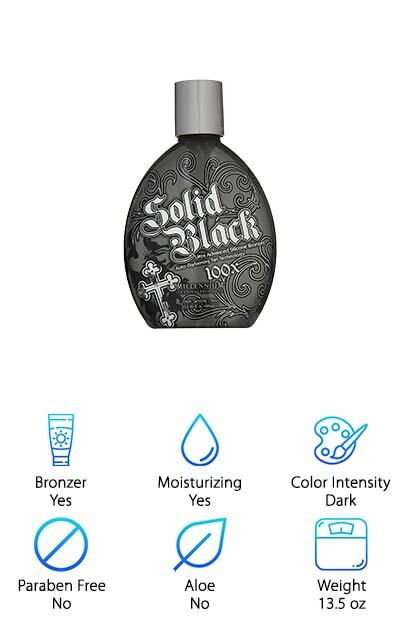 Equipped with a silicone bronzer that gives your skin 100 times more bronze, this auto-darkening tanning lotion is perfect if you can’t wait for results. You’ll leave the salon instantly darker, ready to show off the new you! It features a unique floral smell, specifically “orchid blush,” letting you drift off to a dreamy field of flowers, while the UV rays pump you full of Vitamin D and beautiful color! Regardless of the weather outside, you’ll experience a dose of sunlight and the refreshing smell of flowers. If that’s not a mood and game-changer, we don’t know what is! If you need a strong bronzing lotion that will get you to your maximum tanning potential, then Millenium is the ideal choice. At 13.5 ounces, it will last you for several visits, making it well worth the price and more! Feeling sassy? 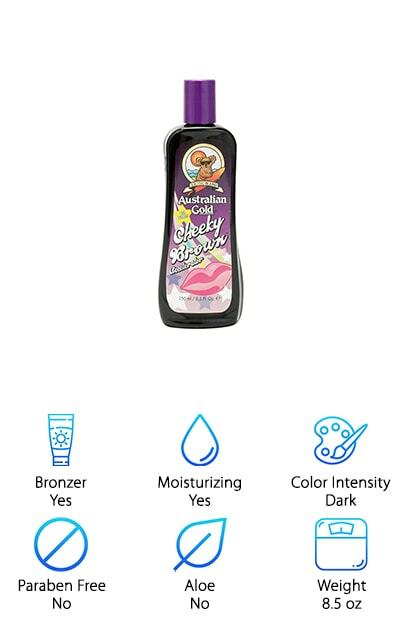 Good, because Australian Gold has a lotion just for you: Cheeky Brown! Experienced tanners know that Australian Gold is a classic line of tanning lotions and oils-- known for its efficiency and delicious fragrances. Beginners, you don’t want to overlook this brand. You’ll love the little koala on the front. He’s a great companion for any tanning adventure. Cheeky Brown is a dark tanning accelerator with bronzer that works to darken your skin and give you an instant glow after just one application. And get this: you can use it in the salon or outside, making it a good tanning lotion for tanning bed and outdoor excursions. A blend of native Australian oils and Vitamins A and E create a hydrating effect that leaves skin feeling moisturized and smooth. Whether you’re looking to darken up before vacation and want to bring your lotion with you, or you love to tan both in and outside at home, Cheeky Brown gives you the option of buying one bottle for all your tanning needs! Are you looking for a good tanning bed lotion that doesn’t contain nasty ingredients and will leave you feeling dark, smooth, and beautiful? Just Nutritive is an all-natural option made with earth-friendly ingredients that aren’t toxic to your body. Specifically, this premium lotion is formulated without parabens, mineral oil, sunscreen, and gluten, making it a healthy and safe option for everyone, including those with a wheat or gluten allergy! And it contains moisturizers, including kokum, mango, avocado, and hazelnut, so your skin will feel hydrated after application. In fact, Just Nutritive works to moisturize your skin for 24 hours, leaving you silky smooth for the whole day! The lotion absorbs quickly to help you achieve a deep tan and the hydrating effect ensures your dark glow lasts longer. Vitamin E and Pro-Vitamin B5 deliver powerful antioxidants to your skin. You can even use this lotion as a daily moisturizer to help you tan last longer, making it a versatile, safe, and effective option. If you’re looking for a tanning bed lotion without bronzer, but that delivers dark results, look no further! Maybe you’re still wondering: What is the best tanning bed lotion? You’ve seen a number of awesome options, and it’s time to introduce you to another! 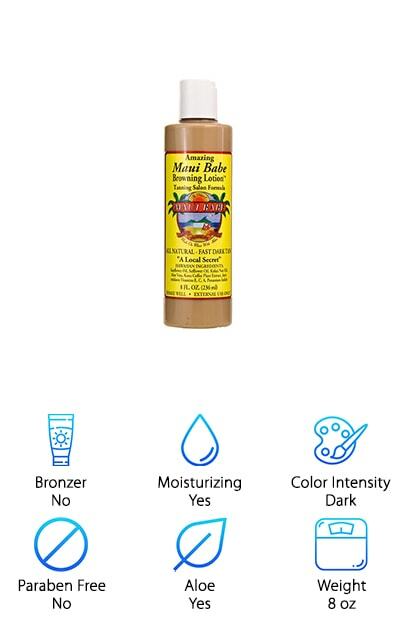 Designed specifically for tanning bed use, Maui Babe is an indoor salon formula made with natural ingredients that deliver glowing brown skin and hydration. Formulated with sunflower oil, it is safe for use on acrylic tanning beds. Even better, it nixes mineral oil, making it better for tanning beds, but most importantly, your skin. Kona coffee extract and vitamins work together to leave you with a deep, dark tan that looks natural and stays with you. You’ll love how you look and feel after using this lotion. Your gorgeous brown tan will be sure to turn heads, and you’ll rest easy knowing you lathered up in ingredients that were safe and healthy for your skin. Available as an eight ounce bottle, you’ll have plenty of lotion for multiple visits, so you can tan to perfection. Get dark and stay dark with our favorite pick for the best tanning bed lotion for darkest tan extraordinaire! 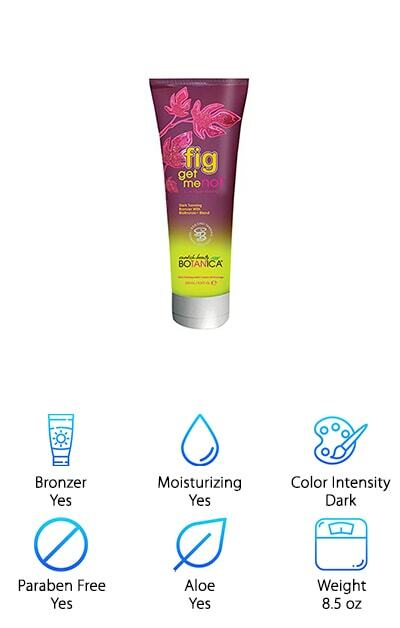 Fig Get Me Not is a clever lotion formulated with a unique BioBronze blend that works as a natural melanin enhancer to prepare your skin for dark color. And color stays once it’s there, thanks to fig extract and Tyrosine bronzers that combine to enhance dark color and make it last. Look dark today and even darker tomorrow with this magic tanning potion! The fig extract works to hydrate your skin and deliver antioxidants for anti-aging benefits, while aloe soothes and Vitamin A protects against future signs of aging. Talk about a powerhouse lotion! What more could you ask for, when it comes to a beauty product? Sold as an 8.5 ounce bottle and featuring a fruity fig smell, you’ll enjoy multiple tans and love how you smell during and after, making this lotion one of our favorite options to tell you about! We committed to bringing you a comprehensive list of the top tanning bed lotions, so we’d be remiss not to mention Sungodz. 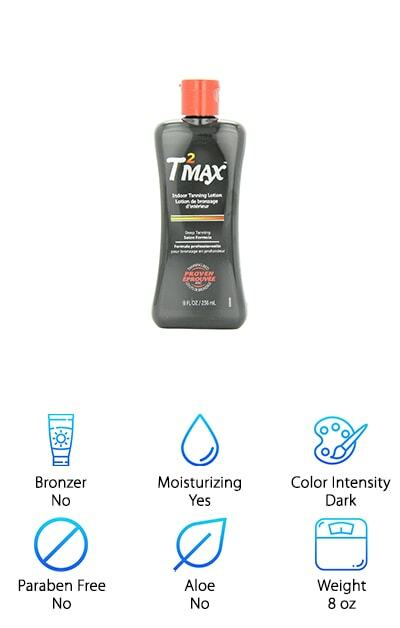 This powerful lotion, which contains a variety of coveted ingredients and delivers up to 375 times more bronze, leaves you feeling silky smooth. The dark tan accelerator works to generate ultimate color and is formulated with shower-proof technology, so it won’t run off. Instead, you’ll enjoy moisturized skin that lasts and keeps you feeling hydrated and comfortable. Inked tanners take note: This blend is safe for tattoos. And your tan will last longer, thanks to a combination of ingredients that keep your skin tan for an extended timeframe. And here’s the kicker: this top contender for the best bronzing tanning bed lotion also works outside, making it super convenient for anyone who loves to tan both indoors and outdoors. Whether you’re headed to the salon or to kick it outside with friends for the day, if you’re seeking a golden glow, then you won’t want to miss out on Sungodz. If you’re looking for the best tanning bed lotion for fair skin, look no further. When you have a sporadic tanning schedule or light skin, you need a gentle lotion that provides lasting color in between visits. 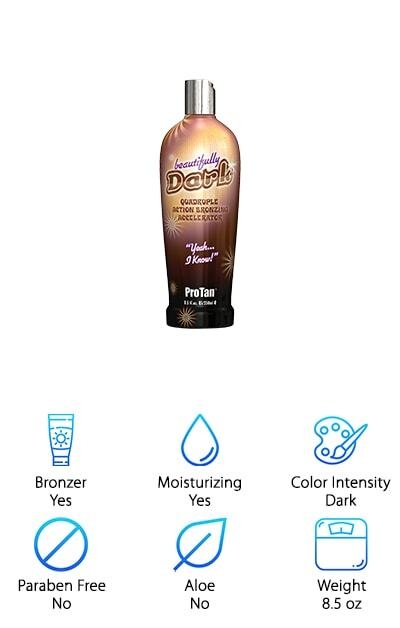 ProTan tanning lotion is made with immediate and extended bronzers that deliver instant color and keep you dark for lasting effects! Formulated with a potent accelerator, the ingredients include sunflower oil, coconut oil, and monoi de Tahiti oil to combat dryness and keep your skin feeling hydrated. This lotion is ideal for both beginners and experienced tanners, as it gently bronzes and darkens for the ultimate glow. The amaretto-vanilla-tangerine fragrance will have you feeling refreshed and renewed and won’t leave you with an unattractive “after tan” smell. To the contrary, you’ll smell fruity and delicious! Best of all, this powerful, but soothing, formula is affordable, so you can achieve maximum results for a minimal investment. Next up on our tanning bed lotion review list is Hawaiian Tropic’s Tan Max lotion. This intense blend of tropical and exotic flora, fruit, and nut extracts is designed specifically for use in the tanning bed. It’s oil-free, so you won’t slip and slide while you’re tanning and it won’t leave a mess when you’re done. As a dry lotion, it absorbs quickly, so you won’t feel a difference. Formulated with Tyrosine and Riboflavin to maximize your skin's natural tanning potential and provide an authentic bronzing effect, this lotion also hydrates, so your skin feels smooth and your tan lasts longer. The ingredient list includes antioxidant Vitamins A and E and is completely hypoallergenic. Tanners with sensitive skin, this is the ideal option for you! And here’s the kicker: you can also use this lotion outside, making it versatile and a one-stop option for all of your tanning needs! 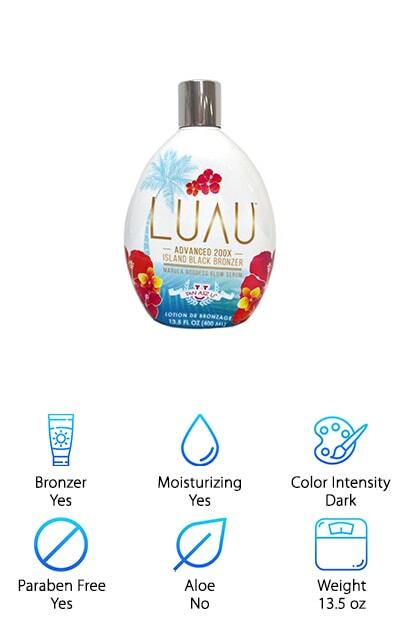 Rounding out our list of the top rated tanning bed lotion products is the LUAU. True to its name, this smoothing, hydrating lotion transports you to a tropical getaway with just a few drops. If you’re seeking a luxury lotion that won’t leave you smelling like coconuts, but will give you all the feels of a getaway, you found it! The gentle smell evokes a relaxing feel, while the ingredients work to produce dark color. In fact, LUAU delivers 200 times more bronze to your skin, so you’ll leave the salon with an instant dark glow! The unique goddess glow serum with high levels of Marula oil leaves skin feeling moisturized, silky, and smooth. Even better, this lotion is paraben and DHA-free, so you can feel good about what you’re putting on. 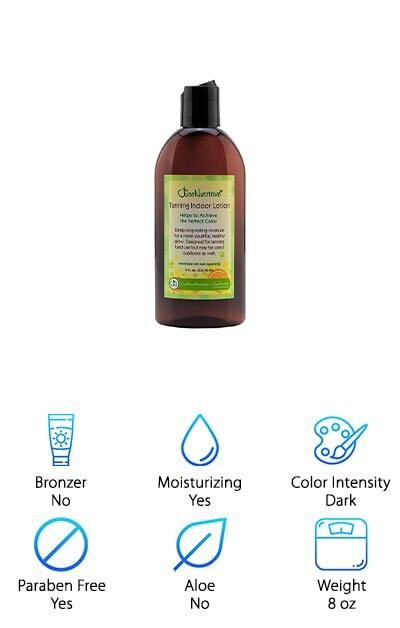 Enjoy maximum color without slathering chemicals on your skin. You will leave the salon darker and feeling great every time, thanks to this luxurious premium tanning bed lotion.